Sunday, Feb 18th 7:30pm Campfire Stories and Songs at the PEEC Pocono Environmental Education Center's Family Nature Weekend. Dingmans Ferry, NJ. For more info contact PEEC at www.peec.org. Thursday, Mar 9th 8-3pm Private Performance for Knollwood School, Parsippany, NJ. Sunday, March 11th 12:30-3:15pm The County College of Morris Storytelling Festival, featuring New Jersey storytellers: Ken Galipeau, Judy England-McCarthy, Linda Howe and Sharon Taksler. County College of Morris, Randolph, NJ. For more info call (973) 328-5076. For Directions -> click here <-. Wednesday, March 14th 2:00pm Private Performance Memory Café, Morris Plains, NJ. Saturday, May 19th 4:00pm Song and Stories for “RANDOLPH ARTS IN THE PARK” at Randolph Community Center and Library, 30 Calais Road, Randolph, NJ 07869. For more info contact www.randolphartsinthepark.com, Email: artworks@randolphnj.org, Phone: 973-989-7081. Saturday, May 19th 8:15pm Campfire Stories and Songs at the PEEC Pocono Environmental Education Center's Environmental Encampment for North Penn 5th Grade. Dingmans Ferry, NJ. For more info contact PEEC at www.peec.org. Monday, May 21th 9:00pm Campfire Stories and Songs at the PEEC Pocono Environmental Education Center's Environmental Encampment for Elkins Park School. Dingmans Ferry, NJ. For more info contact PEEC at www.peec.org. Tuesday, May 22nd 9:00am Private School Performance at Woodland School, Warren, NJ. Tuesday, May 22th 9:00pm Campfire Stories and Songs at the PEEC Pocono Environmental Education Center's Environmental Encampment for Elkins Park School. Dingmans Ferry, NJ. For more info contact PEEC at www.peec.org. Wednesday May 23th 9:00pm Campfire Stories and Songs at the PEEC Pocono Environmental Education Center's Environmental Encampment for Elkins Park School. Dingmans Ferry, NJ. For more info contact PEEC at www.peec.org. Thursday, May 24th 9:00pm Campfire Stories and Songs at the PEEC Pocono Environmental Education Center's Environmental Encampment for Elkins Park School. Dingmans Ferry, NJ. For more info contact PEEC at www.peec.org. Sunday, May 27th 7:30pm Campfire Stories and Songs at the PEEC Pocono Environmental Education Center's Family Nature Weekend. Dingmans Ferry, NJ. For more info contact PEEC at www.peec.org. 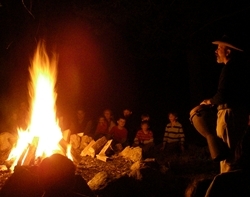 Thursday, June 7th 9:00pm Campfire Stories and Songs at the PEEC Pocono Environmental Education Center's Environmental Encampment for Kinnelon middle schoolers. Dingmans Ferry, NJ. For more info contact PEEC at www.peec.org. Friday, June 8th 11:00am Private School Performance at Camp Mattolionequay, Medford, NJ. 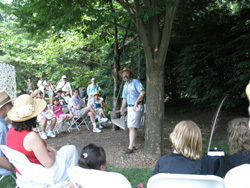 Saturday, June 9th 12:00 - 4:00pm Stories and Songs for "Butterfly Bonanza", Pyramid Mountain Park, Boonton, NJ. For info call 973 334-3130. Tuesdayday, June 12th 8:30pm Campfire Stories and Songs at the PEEC Pocono Environmental Education Center's Environmental Encampment for Wagner School. Dingmans Ferry, NJ. For more info contact PEEC at www.peec.org. Monday, June 18th 8:30pm Campfire Stories and Songs at the PEEC Pocono Environmental Education Center's Environmental Encampment for Wagner School. Dingmans Ferry, NJ. For more info contact PEEC at www.peec.org. Wednesday, June 20th 8:30pm Campfire Stories and Songs at the PEEC Pocono Environmental Education Center's Environmental Encampment for Wagner School. Dingmans Ferry, NJ. For more info contact PEEC at www.peec.org. Saturday, June 23rd 6:00pm Private Lake Community Event, Medford, NJ. Sunday, June 24th 8:15pm Campfire Stories and Songs at the PEEC Pocono Environmental Education Center's Newark Summer Sciences. Dingmans Ferry, NJ. For more info contact PEEC at www.peec.org. Wednesday, June 27th 8:30pm Campfire Stories and Songs at the PEEC Pocono Environmental Education Center's Liberty Trails. Dingmans Ferry, NJ. For more info contact PEEC at www.peec.org. Saturday, June 30th 7:30pm Campfire Stories and Songs at the PEEC Pocono Environmental Education Center's Family Nature Weekend. Dingmans Ferry, NJ. For more info contact PEEC at www.peec.org. Thursday, July 5th 10:00am Private Stories and Songs performance for Paterson Library. Paterson, NJ. Tuesday, July 10th 10:00am Private Stories and Songs performance for Paterson Library. Paterson, NJ. Tuesday, July 11th 2:30-3:15pm "Libraries Rock" program at Sussex County Library – Sussex-Wantage Branch, 69 County Rd 639, Wantage, NJ 07461. For more info call (973) 875-3940 x 206. 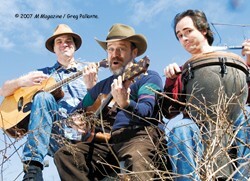 Wednesday, July 11th 10:00am Private Stories and Songs performance for Paterson Library. Paterson, NJ. Thursday, July 12th 10:00am Private Stories and Songs performance for Paterson Library. Paterson, NJ. Tuesday, July 17th 10:00am Private Stories and Songs performance for Paterson Library. Paterson, NJ.